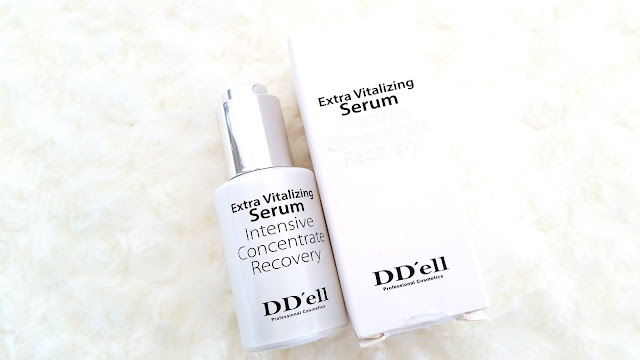 Today I want to share my review of this DD'ell Extra Vitalizing Serum with you guys. I have been using this serum since late last year and I just finished it at the end of March. I decided to wait until I finished the serum to write the review because I wanted to see the end result one bottle of this serum can bring before sharing it with you guys. 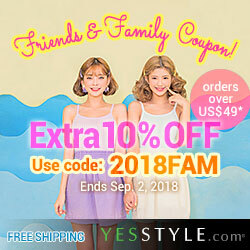 DD'ell is a professional cosmetic brand in South Korea. Their name, DD'ell, comes from the french word meaning 'for women'. The idea is that their brand wants to create products to fulfill every women's needs and desires. Anyways, on to the review! Product Description: The DD'ell Extra Vitalizing Serum is a highly concentrated serum that provides brightening, hydrating, calming and anti-aging effects. The serum includes various ferment ingredients that can provide moisture and anti-aging effects to the skin. It is also formulated with green and brown algae which can prevent photoaging, calm the skin, and reduce inflammation. Niacinamide is the brightening agent in this serum and it is known to be effective. To Use: Apply the serum morning and night after cleansing and toning. 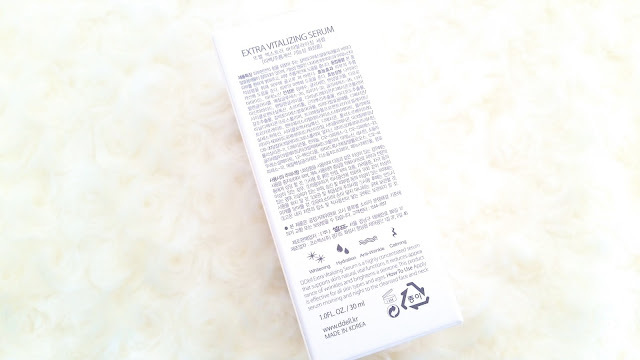 Ingredients: Galactomyces ferment filtrate, bifida ferment lysate, amorphophallus konjac root extract, caulerpa lentillifera extract, himanthalia elongata (brown algae) extract, niacinamide, adenosine, purified water, glycerin, alcohol denat., dipropylene glycol, methyl gluceth-20, PEG-32, glycereth-26, pentylene glycol, divinyldimethicone/dimethicone copolymer, cyclopentasiloxane, sorbitol, dimethicone/vinyl dimethicone crosspolymer, trimethylolpropane tricaprylate/tricaprate, pentaerythrityl tetraisostearate, polymethylsilsesquioxane, cyclohexasiloxane, dimethicone, polysorbate 80, PEG-60 hydrogenated castor oil, cyclomethicone, acrylates/C10-30 alkyl acrylate crosspolymer, arginine, hydrogenated lecithin, polysilicone-11, dimethiconol, panthenol, C12-13 pareth-3, C12-13 pareth-23, glyceryl acrylate/acrylic acid copolymer, lecithin, sodium laureth sulfate, 1,2-hexanediol, hydroxyethylcellulose, C12-14 pareth-12, ethylhexylglycerin, disodium EDTA, phenoxyethanol, fragrance. 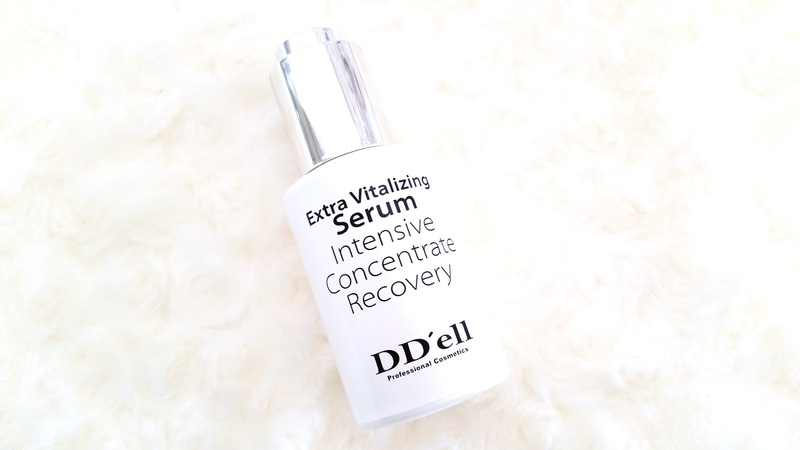 Packaging: Simple yet unique, the DD'ell serum comes in a white bottle with a not so usual dropper top. Instead of the usual squeeze dropper, this one comes with a push-down button. It is kind of temperamental, sometimes it works well but most of the time it is hard to get product up the dropper. The expiration date is printed at the bottom of the bottle. On the box packaging, there are some information regarding the product in both English and Korean. Scent: This serum has a soft floral scent that is fairly pleasant. Fragrance has been added to this product. Color: A milky colored liquidy serum. Texture: The serum is thin and liquidy. It spreads on the skin easily and absorbs fairly quickly. 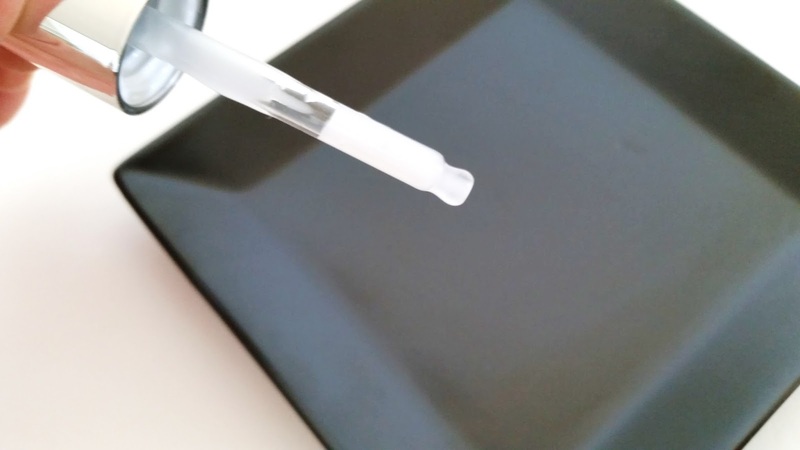 Helen's Thoughts: I have plenty to say about this serum, good and bad, but first I will start with its packaging. This is one unique yet hard to use dropper. It looks nice on the bottle and makes the overall packaging looks clean and neat. However, on a user friendly scale, it is not very friendly at all. The button mechanics does not work so well. Not sure if it was just my bottle but 9 out of 10 times I will have trouble getting the serum into the dropper. It can be kind of annoying at times. Towards the end of the product, it became harder and harder to get the serum into the dropper so I just ended up pouring it onto my palm before using it. When it comes to the benefits of this serum, most of the promises were fulfilled but some were not. One of the main benefits of this serum is its brightening effects. I was able to notice a bit of its brightening effects after a couple of uses but the effects did not seem long lasting at first. However, after a few months of usage, my skin overall looks brighter than before. I cannot just claim the effect all on this serum because I do have a few other products in my routine that provides brightening care as well. 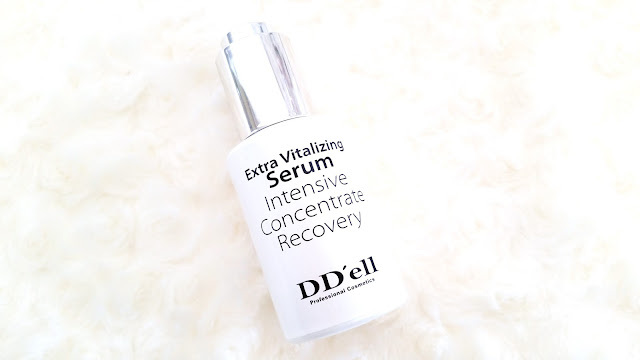 However, I do believe this serum's brightening effects added to the overall benefits and it helped brighten my skin while keeping its effects long after use. Another benefit of this product is its hydrating formula. It is not super hydrating but it provided a good amount of moisture for my normal to dry skin type. I did like the serum's calming properties. It felt really nice when I applied it on my skin and it managed to calm any irritations I might have had. The serum's nourishing formula also managed to care for my skin and soften it as well. The other main benefit of this serum that failed to perform is its anti-aging care. I was really looking forward to this serum due to its anti-aging promises and its pretty great looking ingredient list. From start to finish, I only noticed some temporary plumping effects and some of my fine lines did look slightly diminished. However, the overall effect was minimal and none of the anti-aging benefits were long lasting. Which was disappointing. 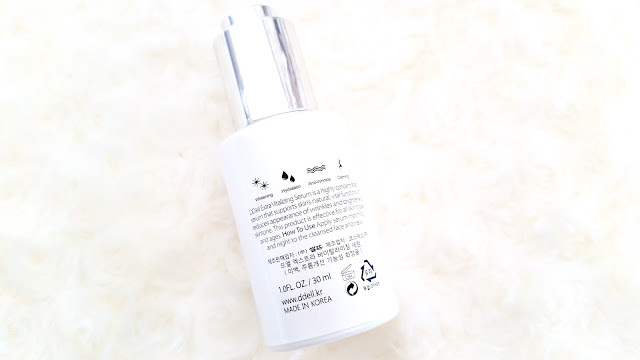 One of the reasons I waited to write my review was because I wanted to see if its anti-aging care would become more noticeable towards the end of the bottle. However, nothing changed and only the minimal benefits were presented at the end. This serum contains some amazing ingredients, many of which provides great anti-aging care. So, it was disappointing to see that it did not do much in the end. Finals Thoughts: I have mixed feelings about this product. On one hand, I loved the brightening care it provided for my skin. It gave me noticeable results that are fairly long lasting as well. My skin looks great and it has a nice glow to boot. On the other hand, the serum's anti-aging properties failed to prove itself. The minimal benefits it provided are disappointing to say the least, especially with its rather nice looking ingredient list. The packaging flaw is also a knock back for this serum. It is just not user friendly. Would I repurchase it in the future? Not likely. While I like the brightening effects this serum offers, I mainly came for the anti-aging care which it failed to provide. I think I will keep hunting for other anti-aging serums. Usually this is where I say if this serum is worth a try or not, however, it seems like this product is either out of stock or no longer on the market. At least, I could not find it anywhere, not even on the official DD'ell website.